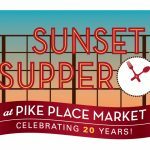 Join us on Friday, August 14 from 7:30 pm – 11:00 pm at Pike Place Market for the 20th Annual Sunset Supper at the Market! This uniquely Seattle event celebrates the Market’s birthday with over 1,400 guests and unlimited food and beverages from 90+ of our region’s finest restaurants, wineries and breweries. Guests are invited to sample gourmet food and drinks, chat with chefs, mingle with friends, take a chance on a raffle or spin the wheel for prices, and dance under the stars to live music. We are very excited to be a sponsor for the market’s event again this year! Sunset Supper benefits the Market Foundation’s mission to end hunger, care for the sick, educate children, and find homes for those without – and it takes place in the heart of downtown Seattle, the Pike Place Market. For more information on the event, ticket prices and availability or the Foundation’s work that supports over 11,000 seniors and families in the Market community, please see Pike Place Market’s Sunset Supper website.